Happy Easter! We've had an eventful Easter weekend. I flew out to Austin to visit my twins, Janice and Caroline. Lucas and Bandana made the trip too! Saturday we participated in Jo's 17 Annual Easter Dog Parade. The parade started on Annie Street and ended at Jo's coffee shop. Jo's is one of our favorite dog friendly spots. Grab an iced turbo (chocolate ice coffee) and a breakfast taco and you are ready for the best people watching! Pups are welcome too! A brass band led the parade to Jo's coffee shop. Dogs were dressed up as hot dogs, ballerinas, martinis, and Campbell's soup cans. Juan Carlos IV and Tex joined us in the parade. Tex was dressed in our batik collars from the Honey collection and looked just like our logo. 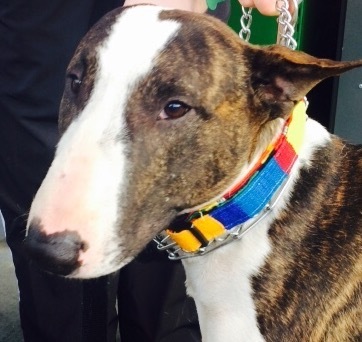 Juan Carlos was in his Easter best wearing our new Daisy Collar from the Rose Collection soon to be released. Caroline and I were dressed in new Collar Me Crazee shirts and hats. Keep a look out they will be up on our site to purchase soon! We had a basketful of eggs stuffed with freebies to hand out to the parade goers. We can't wait to go to our next Austin event and meet our supporters! Bark Happy sponsored a fun meet up at Shake Shack this Sunday in Austin. Bark Happy is a new start up that connects dog owners. It is like Facebook for dogs! Our dogs had so much fun and so did we. The main event was a Puppicino eating contest. Each pup received a free custard and peanut butter sundae topped with a dog bone. Juan Carlos IV won his Puppicino contest. This was not a surprise considering his obsession with food! We loved Shake Shack's dog-friendly patio. 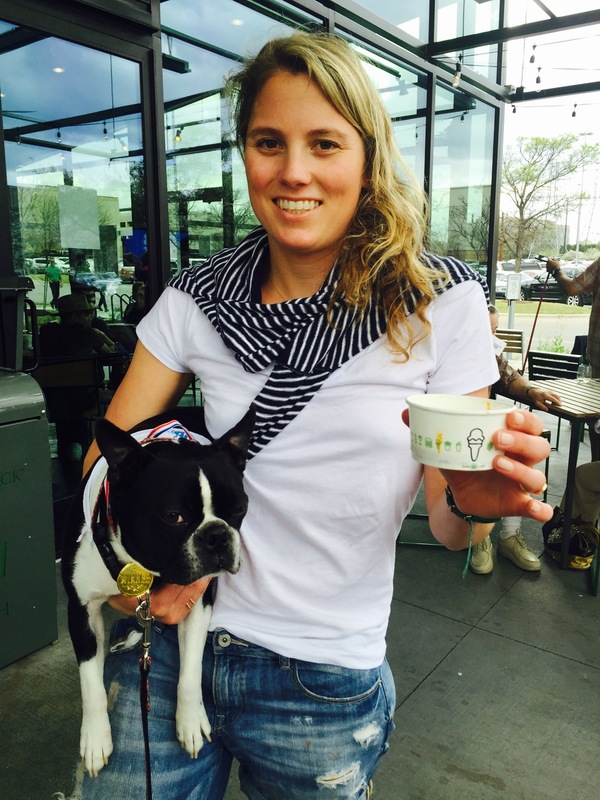 Next time you are a the Domain Shake Shack is a great pit stop for you and your pup. Collar Me Crazee donated a collar and leash for the raffle and we are proud to announce Bill, a Bull Terrier, our winner. See photo below. He chose a Guatemalan Stripe collar from the Bandana Collection. Hope to see everyone at the next Bark Happy event.